I let my boss borrow my WRT310N a few months ago. I didn't need it back since I had so many other routers to work with. 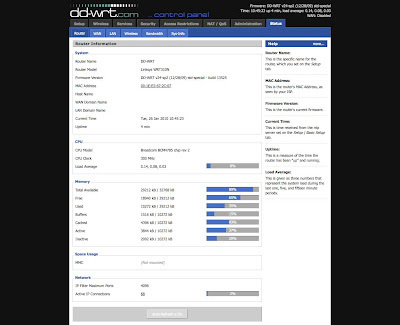 By the time he gave it back, newer versions of DD-WRT had been released. So I downloaded the latest beta release and tried to update it, but unfortunately, it seemed to brick the WRT310N. It did seem to respond to pings when booting, and I was able to tftp a firmware file into it using the reset button/tftp method, but no matter what I did, it wouldn't finish booting. Finally I realized that to tftp a firmware file correctly, I had to hold down the reset button until the power light starts to blink, then release the reset button, then start the tftp transfer. It seemed funny that I'm only realizing this now after having done hundreds of firmware updates using the reset button/tftp method.